Lindenberg Cancer and Hematology Center offers alternative treatments to cancer and blood disorders in a warm environment. After hearing the words “you have cancer,” for most people—their world stops. They think about their loved ones and how they don’t want to miss out on the rest of their life. Going into treatment can be just as nerve-wracking, but there’s one place in South Jersey that treats cancer on a different level in a comforting, soothing environment—Lindenberg Cancer and Hematology Center. 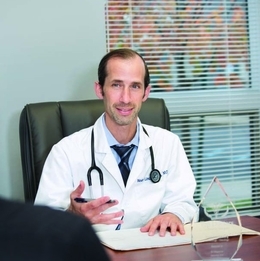 Conveniently located in Marlton, founder and oncologist Dr. Noah Lindenberg treats many different types of cancer and analyzes every patie nt’s case, creating a specialized treatment plan for each patient based on the specifics of how the cancer has progressed. Lindenberg Cancer and Hematology Center stands out among hospitals and other treatment cen- ters in this region for more reasons than one. It may sound unheard of, but Dr. Lindenberg gives patients his cell phone number and they are able to reach out to him anytime. Addition ally, Lindenberg Cancer and Hematology Center is a 4,000square-foot, state-of-the-art facility that offers cutting-edge treatment in add ition to chemotherapy such as hormone therapy, targeted therapy and immunotherapy—a type of treatment that restores the function of the immune system. Dr. Lindenberg is also a hematologist and treats patients with blood disorders, blood clots and a nemia. Just as with cancer patients, he provides a specialized treatment plan for each individual with a blood condition. His facility is equipped with an infusion center that has a comforting, somewhat homey feel to it to put patients at ease. Dr. Lindenberg still has a relationship with Virtua an d UPenn, but opened his private practice earlier this year so patients have other options for treatment besides chemotherapy and they re ceive individualized attention from not just him, but his staff, when going through cancer treatment without traveling beyond South Jers ey. “What’s nice is our staff really gets to know you well, as opposed to getting swallowed up in a system,” Dr. Lindenberg says. His car ing, passionate staff makes every patient feel welcome from the moment they arrive to the appointment and takes their time getting to know them.